~~~Nancy Gurish is a cosmetologist who is interested in staying healthy through natural means~. 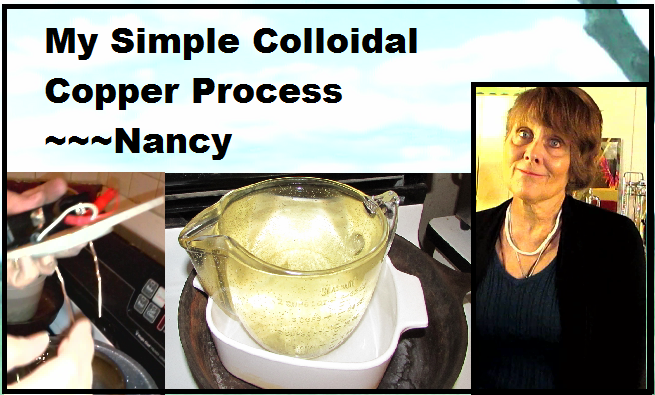 What colloidal silver does for me? Black Salve (Cansema) Apricot Kernels! One of my main interests in life is keeping my arteries healthy and clean! Stay positive about home schooling!(... a video ...)! Many a man will take a difference to this statement - however I'll make this statement anyway. Through clarity of mind and wisdom that I have been given, in this situation - by the Holy Spirit, I have of recent been able to extricate myself from a narcissist person's clutches. I am speaking to are the people who are in difficult situations, whether at a workplace, in a marriage or in family situation. ... read more ... .
Hi there! Some unusual memory floats around in my head from being near the Flats area in my downtown Cleveland, Ohio. It's a pretty day out and my walking campaign takes me into downtown! 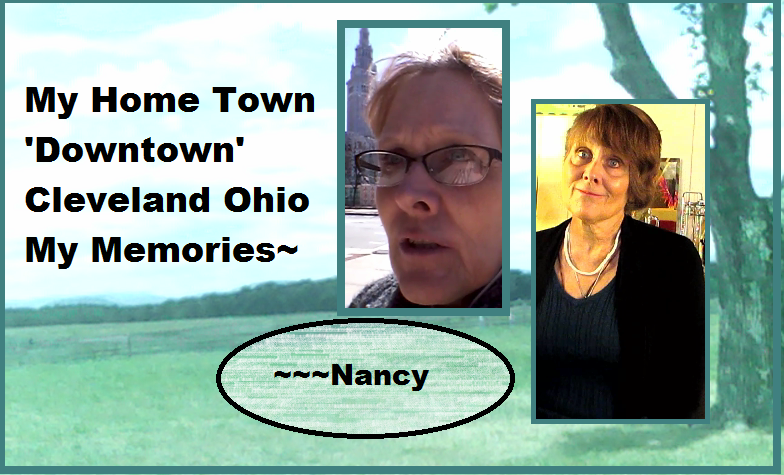 We've got a 'tower' that's Terminal (The Terminal Tower) and a lake that is Erie ... ~~~Nancy . Hi there! Oh - there is a real story behind vitamins. The vitamins that scientists do research on - aren't real vitamins, that is why - vitamins don't work for medical researchers! They aren't real so they won't work! I've used real vitamins for healing and for health and they work!. 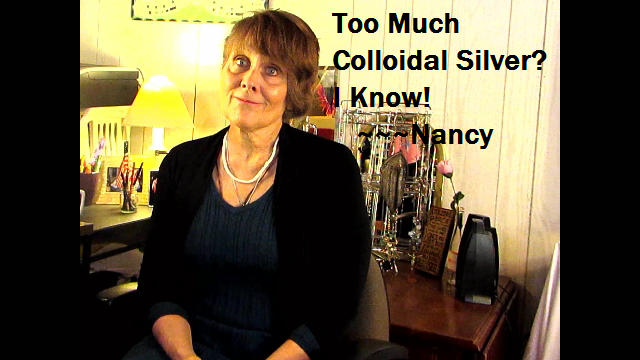 How much colloidal silver should I take? How much do I use to prevent colds and flu and other things? I'll answer that. 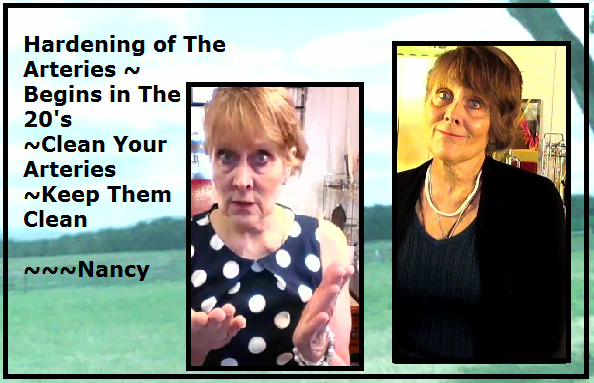 We have forgotten that we have free reign over our bodies! As a people we have turned our bodies over to the will of our doctors. I've done it! ~~~Nancy. Business instructions are in the Bible. The words from the Bible are said to be God's 'love letter' to us. It's said to contain instructions for our health, and for our wealth. I knew this to be true - but I began to study this. Hi! 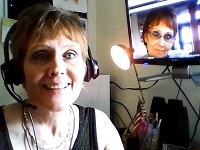 My name is ~~~Nancy Gurish and in this video I describe how I used the product known as black salve, by mouth. In treating my skin cancer (which I diagnosed) I believed that it would be necessary to treat myself from the inside as well as topically. Skin cancer is known to return in a year, and for me it did return in one year. That told me that the conditions in my body were still 'ripe' for this condition to return - and in fact it no doubt was not fully gone in the first place. So, one of my tools in this endeavor was to use black salve by mouth..
Why is it important to 'chew' the apricot kernels? Why is it necessary to soak them? 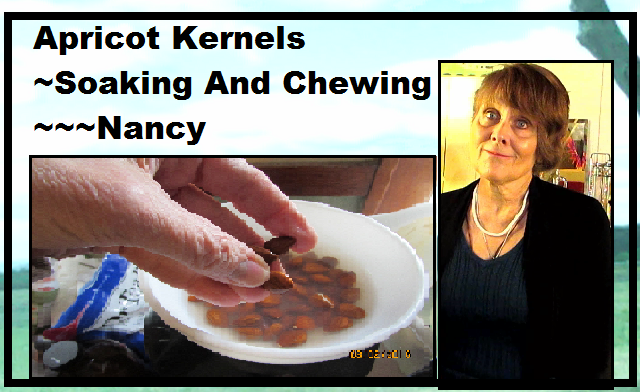 How apricot kernels work inside the body for helping to reverse symptoms that can be diagnosed as disease. Soaking is necessary . "Thank you so much for this simple tutorial. Very helpful.I hand wash some of my clothes using a bucket. So should I first soak & keep the clothes in a bucket of water with added vinegar for sometime and only later soak the clothes in water with mild detergent before washing? Or is it okay to add both vinegar and mild soap together in a bucket of water and soak my clothes before hand washing? Please let me know. Thanks ahead. 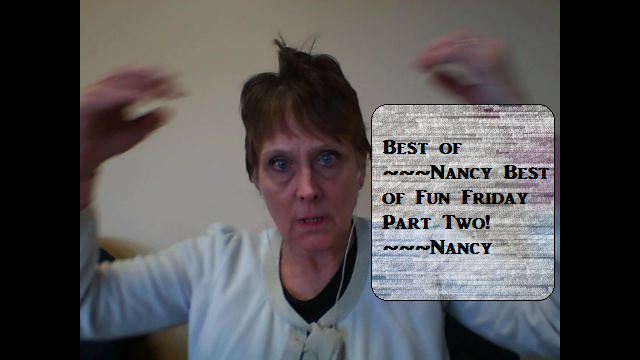 Good day.﻿"
"You talk a lot of sense Nancy...i can relate to the root causes you mentioned :/ Thankyou.."
To the video: Where I Came From In Life! "Nancy, you have just made a 'healing broth' - good for you! There is a cookbook called Nourishing Traditions that tells all about this traditional food/ medicine. 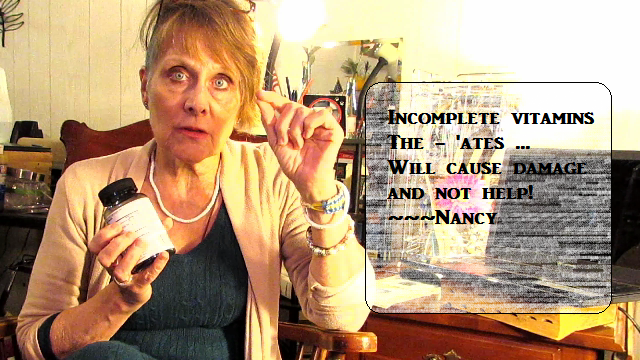 I feed my dog raw chicken too but was instructed to always feed with the bones otherwise its imbalanced food.."
"Hi nancy, Thank you for sharing, we also use black salve and promote it to anyone who will listen.My ears pricked up when you mentioned erratic heart beat. My wife had a racing pulse and erratic beating which was treated with electric pulse and ongoing medication. What is your recommendation for our research. A great shame success has to go "underground"
"This page is under construction! Please stop back again! " "This page is under construction! Please stop back again!." This page is under construction! Please stop back again! "I've been away from web development for a while... but couldn't resist to download and take a look at this. I am amazed. I just wanted to complement you on a beautiful piece of software. I expect there will be lots of web developers will curse it... because it truly hands over the power to the user! I think it's fabulous. Well done. " "Don't have words to say.... it's just awesome I am a professional Web designer for past 20 yrs used scrap Web designing techniques after those days drumbeat software was killed by Macromedia, now I remember those wonderful days... This enables me to create websites in few minutes. Thanks mobirise builder team. Keep going." "Love it! Good timing, too. Have just been researching for… * Responsive site builder (preferably Bootstrap) * Which can publish a site to where I want it …but I guess you knew that ;-) Mobirise looks like the thing! Nice and simple to use. And feels solid and reliable. Count me in if you need any testers." "Loving the additions to the new version of Mobirise web dev app. It's a great, cleanly designed, user-friendly, non-bloated design program. So easy and a pleasure to use. I'm with you all the way with this wonderful project. Keep up the great work on this easy website builder." "I am very happy that you guys released this, not only it is a great idea it was executed properly. I will use this to build a basic site for a customer and send you any bugs or suggestions i have. i looked at the video and was very happy with what could be done. I would really like for Mobirize team to add more widgets to your website design software. I am confident that you will be at the top of the market if you add more features/functionality without loosing intuitiveness! What makes products like this great is many features but so easy to use Thanks!" "Hallo, Your Mobirise is one of the best website builders I have tried to build simple but effective websites, everything is fine, I even began to outline our new corporate and multiple product-oriented responsive websites!" "I had a quick 30 minute look at Mobirise and liked the way it is so responsive. I especially liked the way you could change the view from mobile through tablet and then desktop. best wishes"
"I have found that making my own sauerkraut is the most wonderful thing I do for myself and I let it ferment atleast 3-4 weeks. The longer you let it go seems to give it a richer flavor. My body feels like it is gold in value to me when I eat it, which I do every day. I love it.﻿." "As someone who came to web design from graphic design I work visually & use WYSIWYG web builders with some limited code knowledge - enough to do some minor editing, insert code into head/body etc but that's about it. However the spectre of responsive web design has been weighing on my mind of late, even though I can & do create dedicated mobile pages it is a lot more work, although I do prefer the look of dedicated pages as responsive tend to be quite plain & all the same. But I know having a responsive option would be a good thing to be able to offer if I get clients that want it. Your Mobirise is the first responsive web builder I have seen that is actually easy & so importantly - intuitive!! Thanks!" 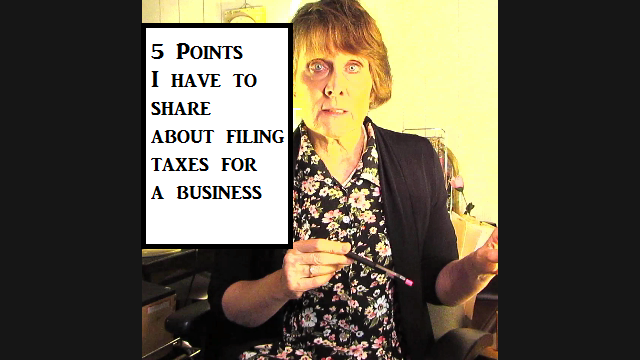 "I have found that using washing powders and dryer sheets prevent mold all together. The liquid detergents and softeners leave residues on the inside of the the drum where it is expensive to remove. Animal by-products or derivatives are in the following products: Bounce, Gain Fabric Softeners and Downy Fabric Softeners (products contain beef fat) and the built-up of these animal based residues may be the source of the mold. Visualize the inside of your kitchen sink drain pipe". “Thanks for a great web building program. It is absolutely awesome and easy to use. "First the joints go, knee and hip surgery happens, medicines, infections, revision surgery and nursing homes for physical therapy. Sometimes it's the beginning of the downward spiral. If a person is young and has a young family maybe their care is good; if older or no support, than maybe not so good. Sometimes all goes fine and who knows. But I chose to use a small amount of epsom salts in my water - on a daily basis; this keeps my joints in better repair because their is too much calcium in the body - we get over run with calcium and don't have enough sources of magnesium. Researchers are beginning to look into whether or not we need to supplement for magnesium - if they are just beginning ..."
"Wow, that's great, thanks for all your research. We did not know about any of this. I think it is essential to give the body what is no longer available in the foods we eat (or in high enough quantities). The only bit I did not understand was the reference to magnesium ( something about Calcium), how does this work? Kind Regards Martin (and Jenny) Lang﻿!" "Your initiative, sharp mental acuity, generosity, perseverance and research are so very appreciated. Thank you and continued blessings. I subbed. Strange but predictable the fact that you have such a low # of subscribers..."